Those of us that work birth know that babies are sentient beings, very present, and wise, they often understand way more than we give them credit for. There is a deep connection to these littlest of people, long before they ever “see the light of day.” Babies are sacred. Aware. And family is the first they know of the world. Family is the place they learn how to love, how to have a sense of humor, interact with the world, mannerisms, habits, personality, religion, passion, dislikes…and on and on. All the details and life experiences they will have that will help grow them into who they will be as adults, starts, at home. The roots of the tree grow in the soil of family. It started with a consultation. We relaxed in lazy boys. We talked of jobs, relocation, married life, this tiny being growing in her belly and I gained a deeper understanding of her. Her husband was kind, and they both seemed excited and ready to make this journey into parenthood, and do so at home. We agreed to work together and so began our monthly visits. She was a first time mom. Fairly quickly I came to understand she was living in her parents house. My Midwife brain immediately went into analyzing the relationship between mother and pregnant daughter. As a holistically trained care provider, I’ve learned to look beyond the physical of a woman’s being and assess the spiritual, emotional and relational aspects of her life, for they all affect birth. We often see how this particular relationship (pregnant daughter and her mother) can greatly impact a first birth experience. So much so that midwives have spoken for generations about not having a pregnant mother’s mother (grandma to be) present for the first birth. You see, crossing the bridge from “woman” to “mother” is a huge journey. It is hard work. It can break you down to your core being and make you rewire yourself from the heart forward. You learn what you’re made of and what your not. All the tools you thought you’d use to get through it, don’t always work and you pull strength from places you never knew existed. You may have to visit dark places in your mind with you eyes squeezed tight. You’ll think and maybe say that you can’t do it. You might think this will end your life. And that womanly part of your life as you know it, is ending. You are reforming into a new being, a whole new part of your psyche is being born…the mother. You will find the light that leads you out but the hardest part is that you have to do it… alone. No one can climb in that body. No one can take away the experience. No one can do it for you. And in the end, it is you who will feel the empowerment of your accomplishment. But from another perspective, mothers hurt when their children hurt. The instincts are strong to care for our offspring, no matter what age we, or our offspring are, or what the situation is. Often the most complicated state of birth can come from a first time mom attempting to cross that bridge with her mother present. Mother can’t fix this one. She can’t do it for her. And she can’t take away the experience that’s happening no matter how difficult it is for her to watch. 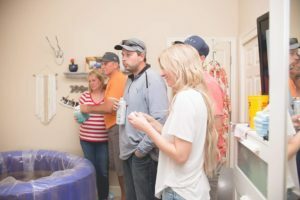 It brings stress and anxiety into the birthing room. Palpable energy emits, and adds tension, pain and fear to the whole process. Many Midwives will report that transfer rates to hospitals increase dramatically for first time mothers who have their own mother present. Back to this new client of mine… in this case, they all lived together. And so we moved forward. Education was key. We spent many evening hours on the far side of town in the lazy boys stretched out over hardwood floors, just talking. As the sun went down I taught all I could about birth. The process from physical labor, hormonal cascades, mental and emotional health and preparation. And as the night crept on we learned together, laughed a lot and built a relationship with each other. They were great parents already, eager to learn, full of questions, and fast to do any “homework” I assigned. They supported each other beautifully, they loved this unborn little girl with their whole hearts and I was looking forward to their birthing day. Once in a while her mother or father would cross paths with us during a visit. Warm and friendly they would say hello and then quickly duck away, giving us privacy. I began to feel like we would have the space needed to allow this pregnant woman to cross her bridge to motherhood without much disturbance. The energy was very compatible regardless of space. She named her baby girl Lennon. And by 36 weeks pregnant she was proclaiming that Lennon would arrive early. I smiled and went right into education mode. “First time mothers average 40 weeks and 5 days” I reminded her. Patience. I gave her ideas things to do, massage, pedicures, movies. We discussed the importance of continued excellent nutrition. “I remind her everyday” her husband reassured me, while teasingly chuckling in her direction. We were seeing eachother weekly now and had continued lengthy visits preparing, preparing, preparing. Cleaning out fears, focusing on affirmations, and loving on baby Lennon’s bump. By 38 weeks she was certain her baby was coming early and despite my policy of not checking women before 40 weeks she really really …really wanted to know what was going on. And so I humored her, expecting to be reassuring her that she really had many weeks to go. As I gathered words of encouragement in my head, I was surprised to find she was indeed very ready to have her baby. We even thought perhaps that evening! Luckily the baby waited a few more days (mama had last minute things to prepare) but labor began early one morning very steady. By 1pm she was ready for support and we (myself and student) arrived at the same time as her birth photographer at about 2pm. She began to second guess herself. She was very aware of the people in her room and not quite into “labor land” yet. A quick check said that we should bring in all our bags, inflate the birth tub and be ready to stay, baby was only a couple hours away at most. She couldn’t believe it and the smile never left her face for a good hour while we set up. Her qualms about it being too early vanished and she began the transitional work of labor, alone in the bathroom with only her husband and a fan. They worked so well together. The bonding that was happening between them from one contraction to the next was inspiring to see. He never left her side. And we did not disturb them much but instead took on a supportive role. Slowly, in the background her house began to fill. Brothers, sister, mother, father. Someone did a Starbucks run. Someone turned on a sports game and occasionally we’d hear a little uproar from the front side of the house. The dogs would bark and the noise level rise. We turned off lights, shut doors and did our best to muffle sound. For the most part, she had lots of privacy. Her only complaint from time to time was her dogs making noise. The furbabies were well aware they were about to have a “skin sibling.” And we did our best to keep them quiet. Sometimes her sister and mother would come near and hang out for a few minutes. Loving her from a short distance and the energy was sweet, and helpful. She stated that she really wanted them present for the actual birth and we agreed to be sure they were in the room for her. She began to move around, bedroom to bathroom, ball to toilet, restless. It became clear her time was close and we filled the pool in her room deep with warm water. She climbed in and immediately settled down. In between contractions she seemed to float and drift, as if leaving this realm to journey to the place where her baby was, and bring her back with her. This was the bridge crossing, the inner work. And my Midwife heart leaped by bounds when I saw her mother and sister were already present in the room. The energy of these women, in this family, it was and is powerful beyond understanding. There were six women present including myself and the laboring mother. And her amazing husband who literally never left her side. Quiet strength was his demeanor and she needed every ounce of it. The room was filled with beautiful dim lighting, a tinkling jingle of soft spa music, a blue tint from the pool of warm water and a palpable energy of absolute… love. Her family, her…women…radiated love in a million different words: success, strength, encouragement, joy, peace, patience… they were quiet and gentle, kind and yet strong and the process of birth bloomed in such an environment. How could it do anything less? Little did I know at the time that her father was standing outside the door, quietly listening, and tearfully sending all his love to his daughter as he heard her work. “I’ve waited for you my whole entire life” she said. “I love you so much.” The tears swelled in my eyes. Everyone in the room felt that moment. What a way to be welcomed to earth, that the first words someone whispers in your ear are how wanted and loved you are, cherished. And that very person is where you get to stay. Embraced in arms of warmth and security. Your first orientation with the world is nothing but warm and sweet, safe and sound. I honestly don’t know how I held it together watching them. The love and light in that room was palpable. The baby was pink, steadily breathing and wrapped in warm blankets on her mother’s chest. She never left her mother’s arms. The first touch she felt was her mother and father. The first voices she heard were theirs, proclaiming their love for her, and then she met her family who did the same. It was like a beautiful, messy, tear filled, impromptu, wedding ceremony where the flowers and cake came after. Only it was a birthday. A beautiful birthday that united a family. 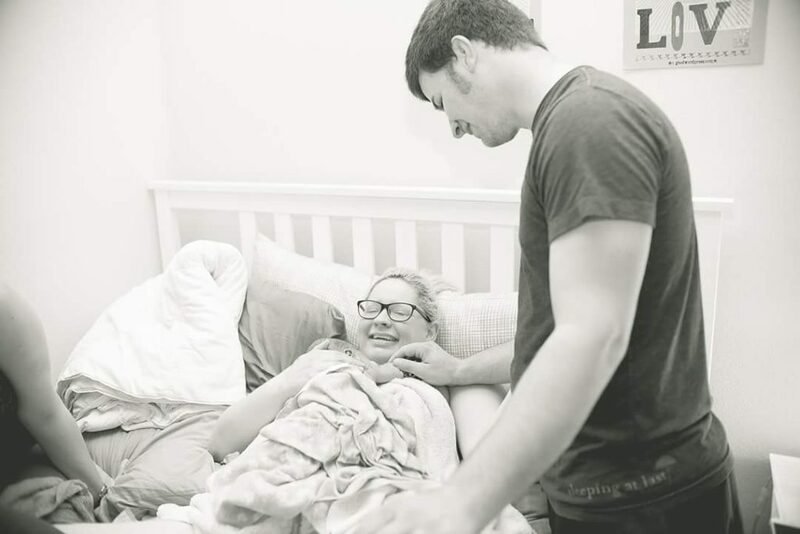 An everyday miracle witnessed by those that love her most. How can there be a better way to come into this life? Marriage connects two families as one, for better or worse. Birth connects those families by generations from old to young. Facilitating a family experience is perhaps one of the most sacred duties a Midwife can do. 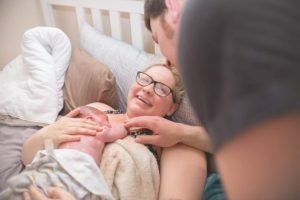 I was honored and privileged to attend this birth and witness the energy and connection this sweet family has intentionally made for each other. I wish them a lifetime of love and generations of sacred relationships.